Every room in your home should reflect you. Your rooms should be functional enough to take on your beautifully chaotic and wonderfully messy, everyday - as well as flexible enough to cater to future plans - like a family. Each month we’ll be highlighting a different room in the home and providing you with tips and tricks to help ensure your home is the best reflection of...you! With May freshly in front of us: let’s tackle the bedroom. Your bedroom, it’s your place to recharge, relax and - if you’re lucky - connect with your partner. Cater to these moments and refresh your bedroom with a couple of updates that encourage relaxation and connection in ways that appeal to your senses. Truly relax in your bedroom by catering to your senses. When looking to calm and relax the mind and body, focus on the larger pieces of furniture: your lighting setup, dresser, and the bed. In our bedroom, we love to take time to ourselves, settle in, open up a great book, and get lost in the words. We may even fall asleep doing so. It’s a relaxing ritual for our minds, bodies, and surprisingly...eyes! Soft, layered lighting allows for diffused, ambient light to fill the room and sets the mood. This romantic setting sends signals to your body and mood, allowing for ultimate relaxation. Tip For Today: Look around and check out your current lighting setup. Make small adjustments catered to you and your habits. Do you read in the evening? Angle a light source towards the spot which you read. Smart, directional lighting encourages certain behaviors in specific areas of the room. Tip For Tomorrow: When revamping your lighting, think broad; then, hone in on the specifics. What is the largest light source in your room? Is it a big, inviting window? Take that sunlight and diffuse it with lightly colored, sheer curtains or window panels! Diffused light minimizes harsh, stark shadows and easily brightens up an entire room. After you’ve catered to the largest light source in your space, move on to the next in size! Scent is powerful - actually, amazing. We’re obsessed with it. We know, it’s obvious from...well, nearly all our posts, but it’s for a good reason! Scents are able to transport the mind. When you breathe deeply into a bouquet of flowery scents like geranium, lavender, and patchouli, you’re transported to a dewy, citrus-y paradise - without even leaving your home. Bring this experience with you into the bedroom. 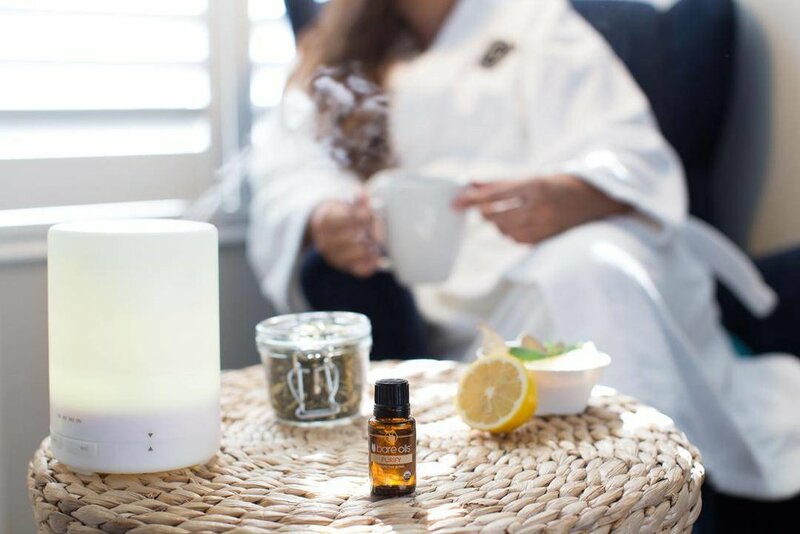 Use scent not only to help you relax and rest, but to refresh as well. Tip For Today: Make yourself a Lavender Bedtime Spray that can also be used to freshen up any exposed linens. Before heading out for the day, spritz a fine mist over any exposed linens in your room. Bed sheets, curtains, rugs, etc. Anything that’s showing! When you return, you will be met with a fully refreshed bedroom! Tip For Tomorrow: Tackle a large surface - preferably one that is mostly flat (Unusual, we know. But trust us: this is going somewhere!). Clear the surface and create a scent station for yourself. This doesn’t have to be extravagant - just a spot where you can cater to your olfactory senses! Here, you can keep a small vase of fresh flowers, a scented candle, or diffuser. If you’re like us, your bed is where you spend at least 8 hours (if you’re not, you should) of your day recharging. You may even spend extra time in bed lounging with a good book, eating breakfast-in-bed, or doing other things like...yoga (between the sheets). Your bed is your everyday sanctuary. Treat it as such! Tip For Today: A made bed makes going to sleep feel like pleasure versus habit. Before you leave for the day, pay special attention to your bed. Are the sheets rumpled? Smooth them out. Pillows looking a little flat? Fluff ‘em up! Tip For Tomorrow: Natural textures like cotton and linen feel great against the skin and create softness and coziness. Next time you’re out looking for a new outfit for yourself, stop by the Home and Bedroom section of the department store and pick up some natural textiles!